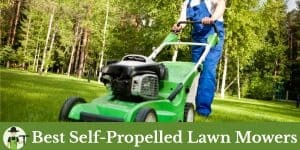 Mowing the lawn is a typical part of everyday life, especially when you own a home. 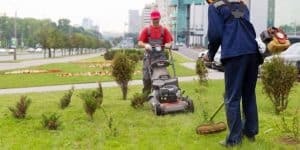 Depending on your yard, you may mow the lawn once a week, once a month, or maybe even multiple times every week; people typically learn how often they should mow their lawns and remember this to keep up with. But how often should you sharpen the blades of your lawn mower? Of course, any lawn mower would be useless without blades that can actually cut grass. The answer to the question is complicated, though. 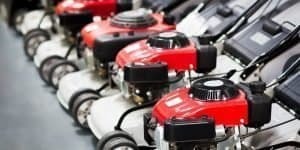 The right time and frequency to sharpen your lawn mower blades may depend on what your preferences are for the quality of your lawn. 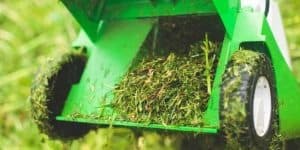 For example, if you don’t care much at all about the quality or health of your lawn and would just like to maintain its general appearance, you might only choose to sharpen your blades once every grass cutting season. 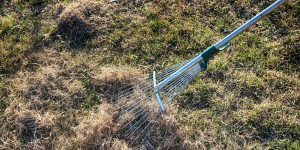 For those who would like to look out for the health of their lawns, it’s more important to keep the lawn mower blades sharp and ready for the entirety of every season. 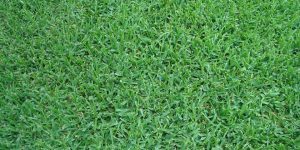 To understand the importance of a sharp blade for the health of your lawn, you should first understand the fact that you’re not actually “cutting” the grass. While that is the common word used to refer to lawn mowing, you’re not actually cutting anything at all. Instead, the blades of your lawn mower are tearing the grass at a certain height. 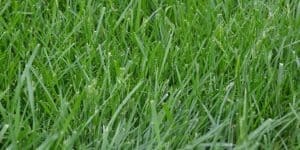 Dull blades don’t tear at the grass very well and end up leaving frayed or brown edges that can affect the health of your lawn. 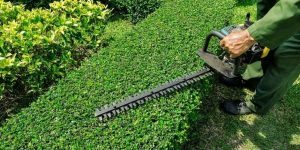 To make sure your lawn is kept healthy and not damaged by the tearing, you should make sure your lawn mower blades are sharpened frequently. 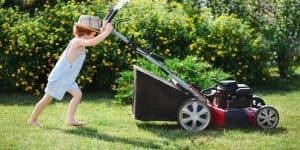 Lawn mowing professionals tend to agree that sharpening your blades once every 25 hours of mowing is a good frequency to prevent damage to your lawn. This may end up being a different length of time depending on the person and how often they choose to mow their lawn. For those who would like to stay as close to the 25-hour mark as possible, you could track your time by noting how long it takes you to mow your lawn once. 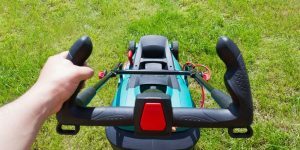 If it takes you approximately one hour to mow your whole lawn, you would need to sharpen your blades after you’ve mowed the lawn 25 times. For someone who only mows the lawn once a week, this may be two months. 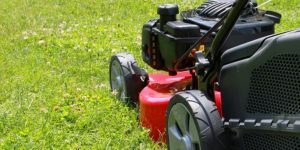 For someone who mows less frequently, you won’t need to sharpen your blades as often. 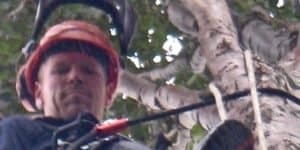 If you’re not interested in tracking how many times you’ve mowed the lawn before sharpening your blades, there are also some signs you could look out for that would tell you when the time has come. 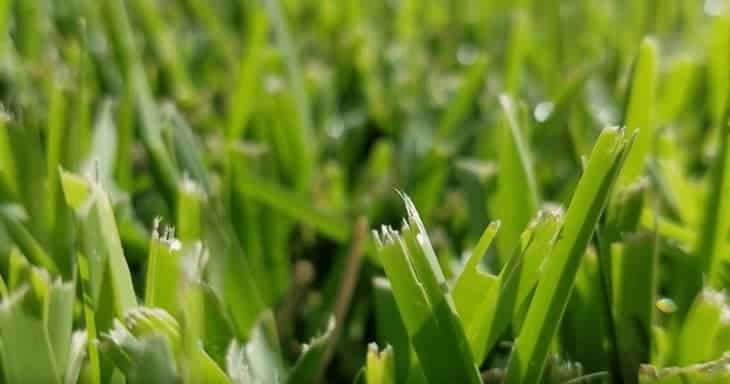 If you notice that your grass is uneven after being mowed, it’s time to sharpen your blades. You might also notice frayed edges or brown at the tips, as previously mentioned. Of course, you could also take a look at the blades themselves and sharpen them when they look like they’ve dulled. When it comes time to sharpen your blades, there are many ways you can choose to do it. It’s important to keep in mind that the way you sharpen your blades is just as important as the frequency of sharpening, so handle this task with great care. You are plenty capable of sharpening lawn mower blades yourself, but you should always make sure to follow instructions carefully so as not to damage the blades. The most recommended method of sharpening your lawn mower blades is to do it with a flat hand file. Not to be confused with a nail file, a hand file is a tool found in most workshops that is used to file things like metal or plastic. It won’t take too much effort to sharpen your blades with a hand file, as the job can typically be done with only around 50 strokes. Make sure to sharpen your blade starting from the cutting edge so that your blade will stay sharp for a longer period of time. Because the file only cuts in one direction, you’ll know that it’s working when you feel it bite into the metal. If you don’t feel it cutting, your hand file is likely to dull, or you may not be pushing down hard enough to file properly. 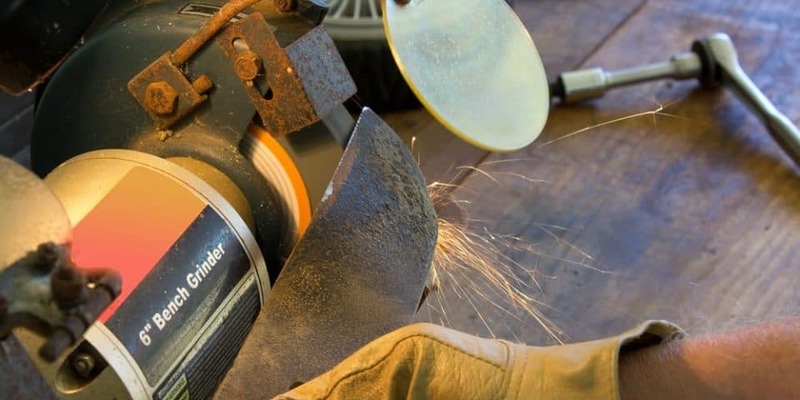 If you’ve chosen not to use a hand file to sharpen your lawn mower blades for whatever reason, you could also use an angle grinder to get the job done. An angle grinder is a much faster solution to sharpening blades than a hand file. Angle grinders can be used for many tasks as well, and are typically inexpensive to purchase. To get started, you’ll just need a socket or wrench, two clamps, a wooden block, and your trusty angle grinder. The first step is to disconnect the spark plug wire and place a small piece of plastic (like a sandwich bag) under the gas cap to prevent leaks. 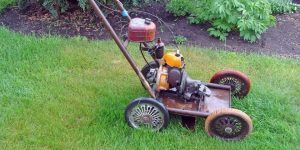 Next, tip the lawn mower over so that the carburetor side is facing upward and clamp the wooden block to the mower’s side to keep the blades from moving while you remove them. Remove the blade and clamp it to your workbench securely. 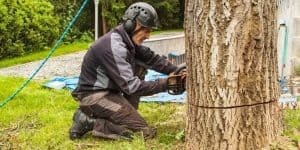 Always make sure to wear proper safety gear, including a long sleeve shirt, gloves, a face shield, and hearing protection. Before you begin, hold the grinder up to the blade to identify the angle you should use so that the grinding disc stays aligned with the blade’s angle. Don’t apply too much pressure while grinding to avoid overheating or grinding away too much of the blade; your goal should be to get the blade to about the sharpness of a butter knife. Continuously check your progress after every couple of swipes of the grinder to make sure you haven’t taken too much off the blade. Make sure to keep each side of the blade balanced as well. 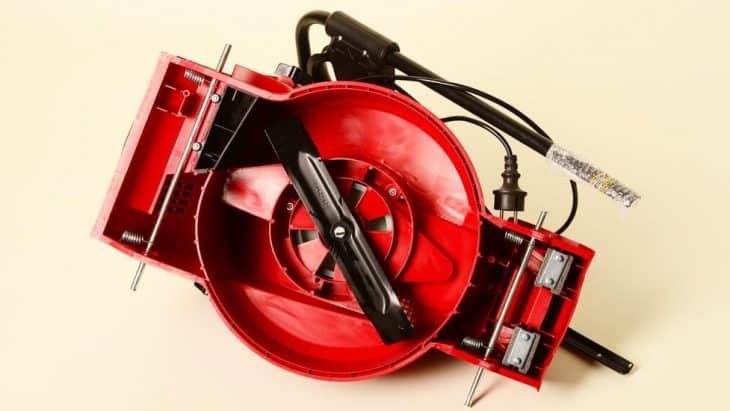 When you’re done, reinstall the blade correctly and make sure it is secured in place.